The yokels are having a hootenanny in the swamp and they want you there to help them celebrate. Click here to play! Party it up with these gap-toothed folk for a chance at plenty of cash! You can't have a hoedown without Granny. Spin this little old lady across the reels as much as possible because she not only acts as a wild, but she will also pay out up to 8000 times your line bet if you can get two to five of her across an active pay line. You'll also want to rub shoulders with Billy Joe. He might spin you one heck of a yarn while smokin' his pipe, but if you can get three to five of him across an active pay line, you'll bring in up to 500 times your line bet. Also watch out for Jeb playin' the banjo, Dwayne and Percy the pig. All of these party guests will bring in some pretty decent cash. Plus, it wouldn't be a celebration without some authentic hillbilly fare. Spin the pie, beans, grits, sardines and pickles for a chance to bring in even more moolah. With the party a'ragin', you're sure to see a visit from the sheriff. But this is a good thing as this man in blue is a scatter and will multiply your total bet if you can spin him three to five times anywhere on the board. So, pull on a pair of overalls and stuff a stick of wheat between your teeth because it's time to get down with the yokels for a chance to win, win, win! The sheriff acts as a scatter and will multiply your total bet up to 60 times if you can spin three to five of him anywhere on the board. Granny is a wild symbol. She will substitute for all others (excluding scatters) to help you bring in more wins. She will also pay out up to 8000 times your line bet if you spin two to five of her across an active pay line. Spin the bonus bottle of moonshine three or more times anywhere on the board and you will trigger a bonus game. 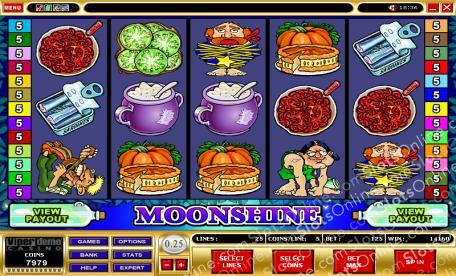 During this game you will get to choose from a selection of moons to reveal multipliers and free spins. You keep choosing until you pick the Start Free Spins tile. Your free spins and multipliers will add up and the spins will begin.